Elena Dawson is a fabulous and edgy Prom alternative to a gown. The lining is white 100% cotton. The size Large is a little deceptive as this can easily fit a number of sizes: I wear a small. Made in England. PAUL HARNDEN shoemakers. Bustle coat. Very minute small distressing to the wool, Should be easily fixed by a tailor Reflected in Price. 100% wool 100% cotton lining Perfect for Spring or fall NOT too heavy. Paul Harnden Shoemakers Navy Jacket in practically new condition. Padded, very warm. Paul Harnden Shoemakers Waxed Khaki Jacket in good used condition. Size Small. Rare find. Highly desirable. Excellent Preowned condition. Hand made. sleeve 23”. Feels very comfortable to wear. I will report you just don’t do it. This designer is on the top list of many celebrities! Made of 100% Wool, lined in 100% Cotton. Shoulders 16.5" / Pit 17.5" / Back length 24.5". Color: Buff. Made of 100% Wool, lined in 100% Cotton. Shoulders: 15.5" / Pit to pit: 16.25" / Back length: 26". Shoulders 16" / Pit 17.5" / Back length 24.5". Made of 100% Silk, lined in 100% Cotton. 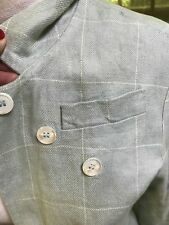 Woven plaid, mother of pearl buttons, eye and hook buttonholes, leather under buttons, exceptional quality.WOW! Dark brown leather jerkin gilet. Made of 100% leather, lined in 100% cotton. Signature leather backed buttons. SIZE SMALL. Shoulders: 13.75" / Pit to pit: 16" / Back length: 16". Dark brown leather jerkin gilet. SIZE XSMALL. Made of 100% leather, lined in 100% cotton. Signature leather backed buttons. Shoulders: 13.25" / Pit to pit: 15.5" / Back length: 16". PAUL HARNDEN WOMEN'S GREY BLAZER washed NWT M 34"
GREAT MID TONE CHARCOAL GREY. SHOU.15".SLEEV. AT BOTTOM FRONT. LINED.MADE IN U.K. EXPOSED POCKET LINING. Downfilled Mac Blazer. Paul Harnden Shoemakers. Color: Grey Composition: 80% Wool 20% Silk. Blazer Condition: 9.5/10. Composition: 50% Wool - 50% Linen. Lining: 100% Natural Cotton. 100% Down (at the bottom until the cotton lining). Color: Black (black color with a mix o green threads). Pit to Pit: 41.5cm. Length: 62cm. Paul Harnden Shoemakers. Blazer Condition: 8.5/10. Lined in 100% ivory cotton. Color: White Composition: 100% Cotton. Composition: 80% Wool ,20% Silk. Lining : 100% Cotton,100% Woon ,100% Down (at the bottom until the cotton lining). Color: Grey. Pit to Pit: 41.5cm. Length: 62cm. Really amazing fruit print jacket from Paul Harnden Shoemakers. Light and airy. Size M which is about a U.K. 8-10-12. Paul Harnden Shoemakers. Pocket Blazer Skirt. Blazer Condition: 8/10. Skirt Condition: 9 /10. Composition: 100% Silk. Lined in 100% ivory cotton. Color: Green. Composition: 50% Wool ,50% Linen.Lining: 100% Natural Cotton. Color: Black. Length: 69cm. Don't forget to check my. Shoulder to Shoulder: 37cm. Paul Harnden Shoemakers. Double Breasted Mac Blazer. Blazer Condition: 9/10. Color: Green Composition: 100% Wool. Item: PH Woman Tweed Suit. Blazer s2s 40 cm p2p 42 cm lengt 65 cm sleeve 57. Pants waist 41 hip 51 length 80 inseam 44 hem 21. Condition: new. Item: Paul Harnden Woman Downjacket. Material:20% silk / 80% wool. Item: Paul Harnden Woman Downjacket. Condition: new. Material: wool/Linen. Item: PH Woman Boy coat. Condition: new. Material: wool/linen. 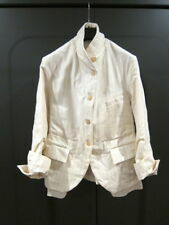 Item: PH Woman Silk New Blazer. Material: Silk. Condition: new.